Corymbia ficifolia (syn. 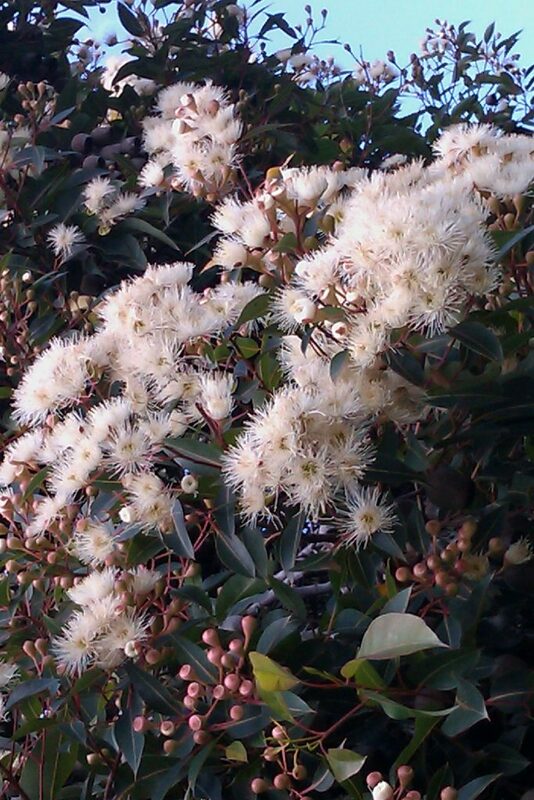 Eucalyptus ficifolia) ‘Snowflake™’ is a white flowering grafted form of the popular Flowering Gum, it has a mature height of 5-6 metres and a width of 3-4 metres. It is an excellent small Australian native specimen tree for domestic landscapes, and is also an ideal choice for street or avenue plantings. Its dense crown of foliage makes ‘Snowflake™’ extremely useful as an informal screen. ficifolia‘Snowflake™’ features a rounded crown of foliage, which is a perfect background for the masses of pure white flowers. The flower colour is a clean, stark white, which contrasts well against the foliage. They are produced over late summer and Autumn and are bird attracting, making ‘Snowflake™’ a great addition to a native garden. ‘Snowflake™’ is grafted onto specially selected rootstocks to ensure compact mature height and form, so it is well-suited for street plantings or parklands where a uniform habit is required. Grafting also guarantees the flower colour, and ensures that it will tolerate a wide range of soil types. A hardy small tree, ‘Snowflake™’ will tolerate a range of conditions, but will perform best in full sun with a well drained soil.